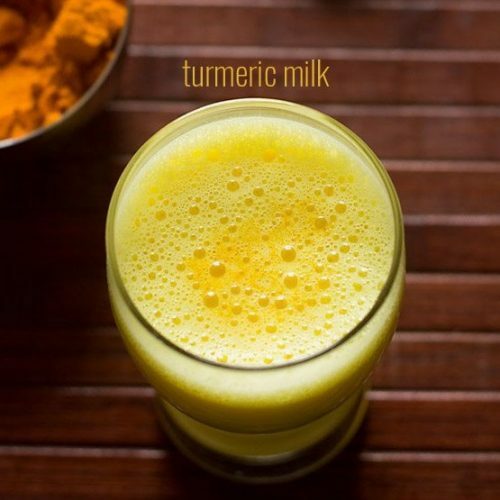 turmeric milk is a traditional healthy indian drink made with milk and turmeric powder. heat 1 cup of milk in a saucepan/vessel on a low to medium flame. simmer the milk for 2 to 3 mins or until it boils. once the milk starts boiling, then switch off the flame. pour the hot milk in a glass or mug. add 1/4 teaspoon of turmeric powder. serve turmeric milk hot or warm. - if you like the milk to be sweet then you could add 1 teaspoon of sugar to turmeric milk but its optional. kids would like to have turmeric milk with little bit of sugar added to it. - the recipe can easily be doubled or tripled.